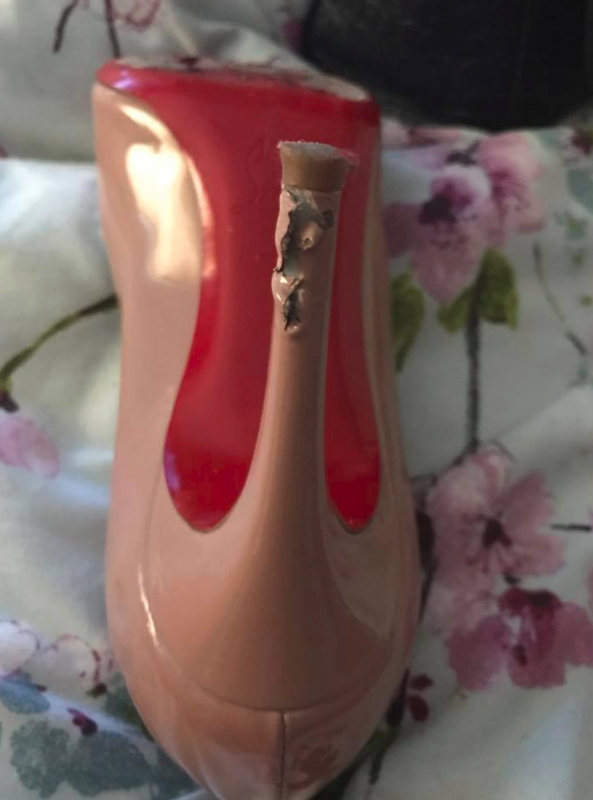 A SCOTRAIL customer has blasted the firm after her £420 Louboutin shoes were ruined following a cancelled service. Gwen Watson Smith, 45, got on a train on Friday morning at Bathgate, West Lothian, with her husband David, 54. However, they were soon told that the train they were on had been cancelled due to signalling errors and therefore had to get back off. As Gwen struggled with her bags and her husband’s wheelchair, she caught the heel of her pink Louboutins as she got off, ruining the pricey shoes. She’s now faced with the prospect of sending the shoes down to specialist shop in London to have them fixed, adding to the £420 she spent to buy them. She posted a picture of her ruined shoes to the ScotRail Facebook page on Friday with the caption: “£42O pair of Louboutins wasted after getting off train that you decided to cancel. NHS training day in Fife where we would give feedback to GP’s about our experience. “My husband had a heart attack in 2015 and is waiting on a transplant so that’s why we were going. “However, when we were on the train at Bathgate station, we were told trains were stuck at Partick and there had been a signalling error at Haymarket so the train we were on was now cancelled. “It was a busy train and I had my handbag and my husband had his medication on his lap. It fell to the ground and people wouldn’t move to get out the way. “It was pandemonium as we got off and then I obviously caught my shoes. I’m going to have to take them to the cobblers but it’s unlikely they’ll want to touch them. Facebook users were quick to react to her post.